The Delaware eviction notice forms are forms that may be used to inform a renter either that he or she is in violation of the rental agreement and he or she needs to rectify the situation or face summary process (eviction) or to inform a renter that the lease term is up and landlord does not intend to renew and that tenant needs to be out of the premises by the end of the term or face summary process. If summary process is called for, the landlord will have to make sure he or she has properly sent notice and allowed the requisite time period for compliance. A Complaint will then need to be filed with the Justice of the Peace Court nearest the property in which the tenant resides. A $40 fee plus a copy of the notice sent to the tenant will need to be included. 5-Day Notice to Quit (Non-Payment of Rent) – This notice is for use when a tenant has failed to pay the rent when it is due. The landlord must send a demand for payment and tenant has five business days to respond by paying rent before the landlord can take further action. 7-Day Notice to Quit (Non-Compliance) – This notice is for use when a tenant has breached the lease agreement in some way. The tenant will have seven days to take corrective action before the landlord can continue the eviction process. 60-Day Notice to Quit (Month to Month Tenancy) – This notice is for use when a landlord seeks to inform the tenant that the lease will end at the end of the term and not renew. Step 1 – The landlord must determine which type of notice is required to inform the Tenant of the potential for summary process (or eviction). If the tenant has failed to pay rent, the Landlord may use the 5-Day Notice to Quit (Non-Payment of Rent). If the tenant has failed to comply with a provision of the lease agreement, other than the failure to pay rent, the Landlord may use the 7-Day Notice to Quit (Non-Compliance). If the Landlord is seeking to make sure that the tenant moves out at the end of the lease term, he or she may use the 60-Day Notice to Quit (Month to Month Tenancy). Step 2 – When the requisite time period for the tenant to respond has expired without a satisfactory response, Landlord may begin Summary Process proceedings by filing a Complaint with the Justice of the Peace Court Nearest the Property in question, along with a filing fee of $40 and a copy of the notice sent to Tenant. Complaint Form – You may also use the Interactive Form-Filler that is recommended by the State to create your Complaint and begin to obtain possession of a residential rental unit. Step 3 – The court will serve the papers on the tenant and a trial date will be set. Step 4 – If there is a judgment in favor of the landlord and tenant still does not vacate the property, the landlord can ask for a writ of possession from the court. At least two documents will be necessary. The first will be the Lease that has been violated which you should be able to obtain from your records while the second is the Delaware Notice to Quit Form which you may download using the buttons under the image on the right. Locate the party on the Lease that has violated it, then enter this Name on the blank line next to the word “To” at the top of the page. The City, County, Zip Code, Building Number and Street, and Apartment Number must all be supplied on the blank spaces in the first statement (in that order). The next statement will require the Signature Date reported on the blank spaces provided. The Signature Date (on the Lease) must be reported by entering the Calendar Date in the first space, the Month in the second space, and the Year in the third space. Place a check mark attached to one of the following statements. Make sure to fill out the required information for each choice. The Nonpayment checkbox will give the Tenant five days to pay an Overdue Amount of money or surrender the residence to the Landlord or Authorized Agent. Choosing this statement requires you to provide the Name of the Authorized Agent, the Dollar Amount Due, and the Rental Period that must be paid in the spaces provided. The Noncompliance checkbox will give the Tenant seven days to correct the lease violation. If choosing this statement, report the Lease Term that has been violated and needs to be remedied on the blank line provided. The Month to Month Tenancy checkbox for Landlords will inform a Tenant the Lease Agreement shall end on the Calendar Date you must enter on the blank spaces in this statement. 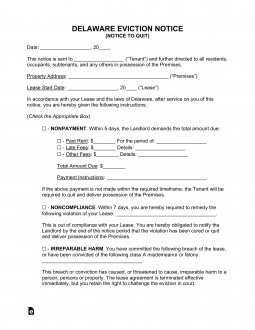 Keep in mind the Termination must be listed at least sixty days from the Date the Tenant receives this Notice. The Month to Month Tenancy checkbox for Tenants will require the Date this Lease Agreement will be Terminated to be entered. This should be at least sixty days from the receipt of this Notice by the Tenant. The Agent of Delivery will need to certify when this completed form has been delivered to the recipient by providing the Date using the appropriate blank spaces in the statement below the heading “Certificate of Service”. The last blank line of this statement will require the Name of the individual who has accepted this Notice. Finally, the Agent of Delivery will check the first check box if this form has been delivered to the intended recipient personally, the second check box if it has been left with reasonably reliable second party (such as a co-worker at the recipient’s job or a household member in the recipient’s home), or the third check box if the completed form has been mailed to the recipient directly, using First Class Mail. The Agent of Delivery must Sign his or her Name on the last blank line.